The latest news going around is that LifeMiles has finally done what every other frequent flyer program in the world does, and allow customers to mixed different cabin classes on award bookings. However, hidden in these changes are some other crucial changes to LifeMiles, especially how the routes are calculated. 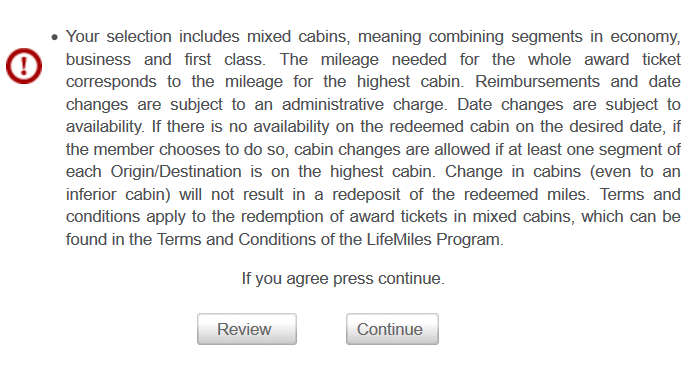 So, while LifeMiles allowing mixed cabin redemptions gained more coverage than Kim Kardashian over the past few days, let’s delve deeper into the nitty gritty of the changes. Of course the biggest news is that mixed cabin redemptions are finally possible. This means when redeeming flights for Lufthansa First Class for instance, where before you would have to book two tickets (or make your own way to the gateway city), now you can connect in Frankfurt on one ticket while paying no additional cost. The other advantage is for people living in small cities with only economy class service. Previously premium cabin LifeMiles redemptions weren’t possible at all, but now, you can redeem for not only business but first class as well. Previously, this redemption would only have been possible in economy class. As one would expect, in the case of mixed cabins, the entire itinerary prices out as the highest class of service. While this is to be expected, this also causes itineraries with the long leg in economy and the short leg in business class to price out as business class. Not a huge deal, but you have to notice it. In the above example, you’ll have to pay the business class rate of 63000 miles for the entire route, even with the transatlantic leg in economy class. Luckily, there is a warning if you try to book any mixed cabin itineraries. LifeMiles has long been blocking Singapore Airlines award availability to Australia using LifeMiles. Singapore Airlines flights to Perth were available for redemption, but flights to Melbourne, Sydney, Brisbane and Adelaide in business class were never available, despite seats being made available to other programs such as Aeroplan. Now, I’m pleased to say that all Singapore Airlines award availability through Star Alliance can be booked via LifeMiles. Another airline that has historically been blocked on LifeMiles are business class award seats on Air New Zealand. Like Singapore Airlines flights to Australia, those are also now available with LifeMiles. Around December 2014, the LifeMiles engine took a drastic turn for the worse, and blocked out many even seemingly normal flight connections. This especially affected Australia where almost all flights from Australia to Asia connecting in Bangkok on Thai Airways were blocked. This issue has now been resolved, and flights with logical connections are showing up available for booking. Hopefully you’ve been reading up to this part. If you have, I just wanted to let you know that there are many creative routings that are available. For more details about these redemptions, see my previous post on Lifemiles. That should give you some insight about the strategy involved with finding a good route. That’s all I will say for now, as previously talking too much has not yielded a positive experience. So, if I do file a DoT complaint, y’all will never hear about it 😉 Just kidding – if you do want to let me know of anything special, I can promise you my lips will be sealed. Also, if you didn’t go to PointsU or aren’t in my private groups, shame, because I sadly won’t be writing any more password protected posts anytime soon. If you are a frequent reader, please send me an email. Password protected posts? Can pointsU students get up to the speed! Thank you Jeff on the update. I guess I will not miss my star alliance status with this. Hi send me lifemiles tricks. I plan on possibly buying lifemiles in the future. Thank you for your work, Master! I have been a member in Lifemiles, I would like to also know something about the tricks! And the main question for me right now: I urgently need to know how to book Lifemiles SQ first class! This is possible with the help of a trick! If you know, help me, please !! !